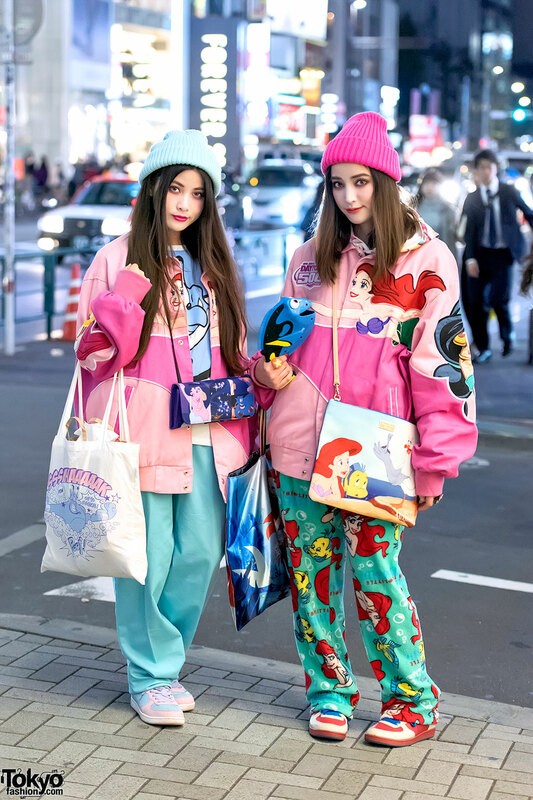 Harajuku sisters dressed in matching pink “Disney Princess” bomber jackets with colorful Disney accessories, Disney purses, and sneakers. Harajuku girl with pink braided hair, Marilyn Manson sweatshirt, black skirt, backpack and mary-janes vs. Harajuku girl in black and red top and skirt with lace details, buckle shoes and tote bag. Harajuku girls in colorful outfits, with arm warmers, socks and sandals, cartoon print t-shirts and colorful hair accessories. 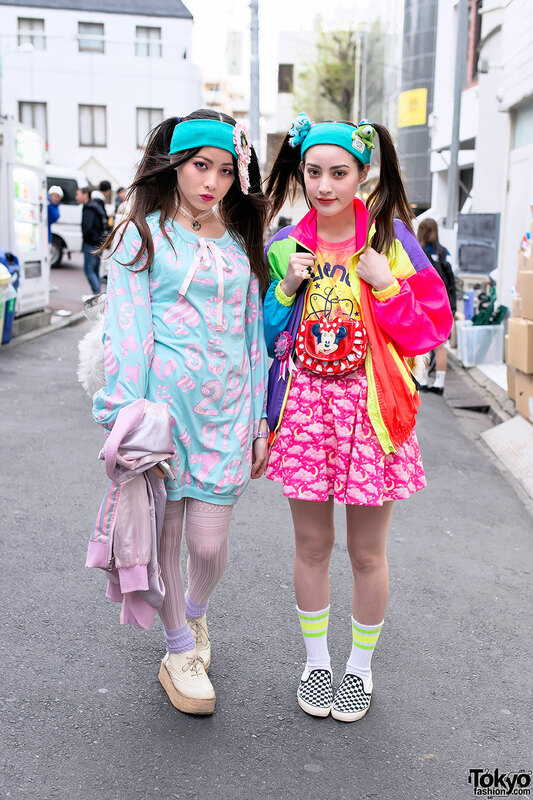 Harajuku girls in colorful outfits, wearing matching ice-cream print sweatshirts with animal-shaped bags, printed leggings, hair accessories and heart rings. Harajuku sisters with matching plush cats wearing skull t-shirt, maxi skirt and ankle boots vs. pink beanie and jacket with leopard shorts & sneakers. Harajuku sisters with Disney bags, t-shirts, mini-skirts, hair accessories and socks with sandals. Harajuku sisters wearing colorful t-shirt and shorts, candy jewelry, Disney bags and socks with sandals vs. floral t-shirt, high waist skirt, tote bag, bow & socks with sandals. Sisters on Cat Street in Harajuku wearing matching twintail hairstyle, matching platform sandals, and color accessories. Harajuku sisters wearing oversized Mickey Mouse t-shirt with flatforms, tiger head backpack and cap vs. t-shirt and shorts, slip-ons, tiger head backpack, beanie and neck purse. Harajuku sisters with cute twintails hairstyles, headbands, colorful fashion, and tiger head backpacks.